Nomads are a people of essentials. Their focus is on their herds, taking their animals to new pastures and managing a highly complex process that demands the herder’s constant awareness and synchronization with his beasts and the environment they share. Tibetan nomads come from a complex culture, rich in arts and literature, but because they move, they have simplified their life, retaining only what is essential to their needs. We have much to learn from this combination of complexity and simplicity. At Norden, we have extracted the essentials of this lifestyle, in a way that it can be shared with those coming from outside its sphere. At Norlha, we have combined the materials the nomads use in their everyday life with their transformation through spinning, weaving and felting, creating new livelihoods as well as an awareness of the beauty precious materials and highly skilled hands can bring about. View the Norlha lifestyle in Norden’s environment, where we have combined the two. 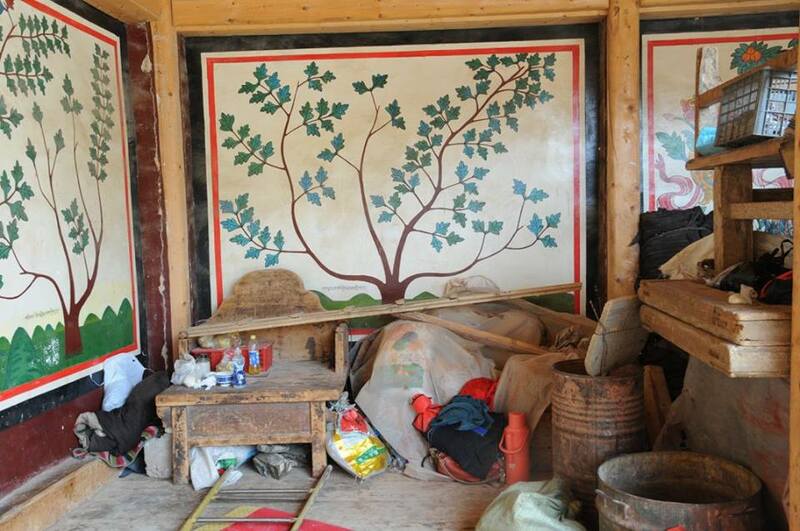 The Lungta Coop brings together 19 nomad families from Tsayig, an area over the hill from Sangkhok. Most people in the area lived from a mixed economy, a combination of farming and yak and sheep herding. 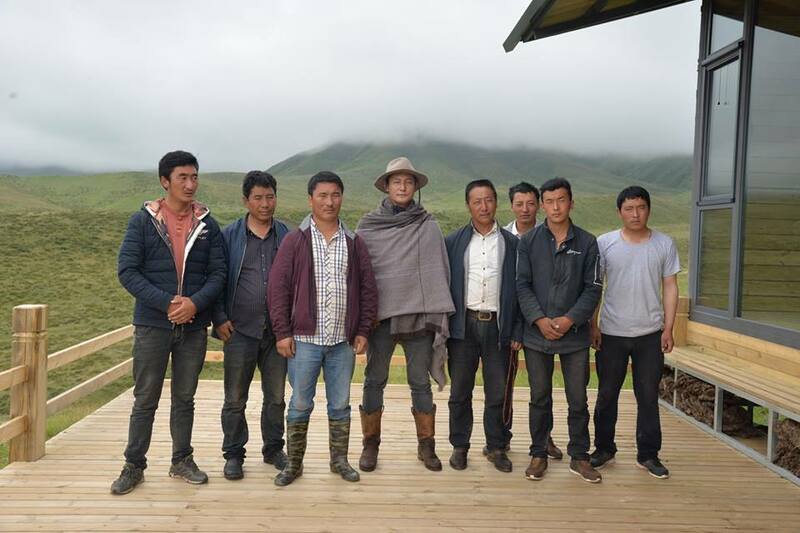 Lately, they found the area could not support large numbers of yaks, and under the guidance of Yidam’s older brother, they formed a cooperative they called Lungta, and pooling their resources, leased pasture in Sangkhok, moving there with 140 yaks. Twenty years ago, the Sangkhok grassland, along with many other areas, was divided up between the local nomads each parcel fenced off. Over time, some nomads chose to sell their animals and lease their land, as in the case of the pasture acquired by the Lungta Cooperative. Lungta has 140 yaks, that are milked daily. 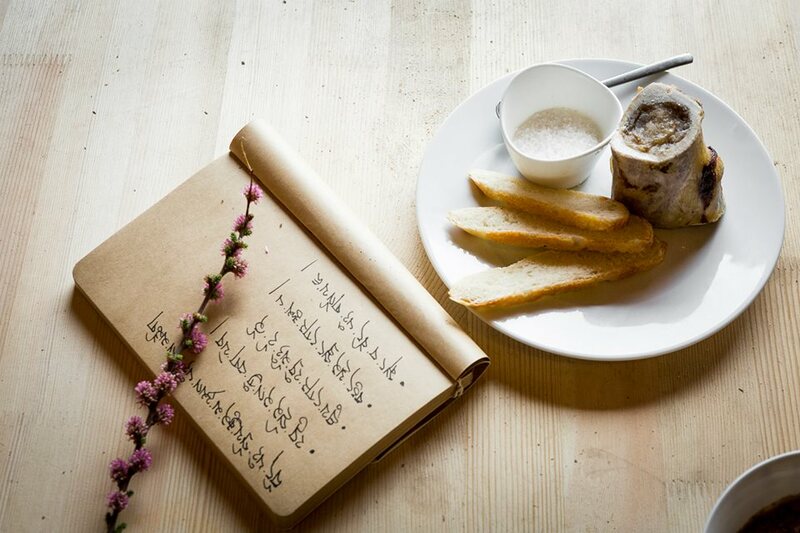 The milk is made into butter and yogurt which is sold locally and highly popular and appreciated for its purity. Next year, Lungta will be establishing a cheese factory, modeled on the small enterprises that exist in remote areas in the French and Swiss Alps, and produce hard and semi hard cheese. A French expert has already visited the area in the Spring and the building is planned for construction early next year. Milking the dris takes place twice a day, early in the morning and in the late afternoon, when the animals return from the wide grazing areas that extend all around the Cooperative. I visited on an early foggy morning. The dris were tethered, waiting patiently for their turn, while the yeko, the babies born in the Spring hovered around their mothers, or played in groups. Up on the hill, the horses were let out of their corral, while the mastiff barked at the intruders. We had milk tea in the large yak hair tent, which was warm and cozy. There is nothing like the thrill, often romantically exploited in films, of galloping through the grassland, preferably at the peak of summer, when the wild flowers lend it their color; yellow, blue or spots of pink, purple or red. Traveling on horse was the best and was, until recently, the only way. In some areas of the pasture, covered in green bumps, it still is, as only a horse can pick its way through a terrain that is even difficult even to walk on. With the advent of cars, trucks, buses and motorcycles, we have lost the sense of crossing a road less area guided only by the sun, starting at dawn and riding until afternoon, only dreaming of these journeys from the tales told by the older generation; three months trip from Amdo or Kham to Lhasa where they describe the changing scenery, rising up to tall passes that command breathtaking views to descend into narrow valleys, through towns villages and nomad camps where they could buy provisions and expect local hospitality. Those days are gone, but one can still get a taste riding from one place to another on horse, watch the sky change, the grassland go from yellow to green, hear the marmots screech at each other from one hill to the next with the eagles circling overhead. 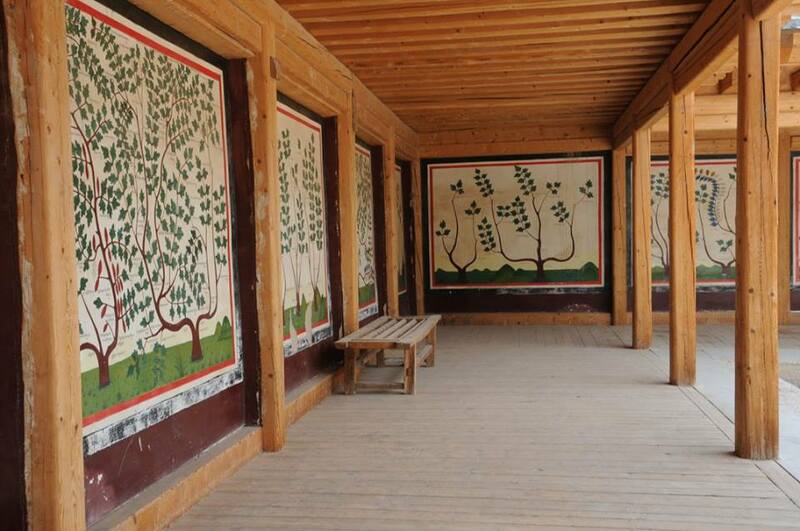 Kangtsa is a small monastery about an hour from Tso, situated on the border with Zorge and Kakya. Coming from the surrounding grassland, it offers a stark contrast with its narrow valleys and juniper forests. 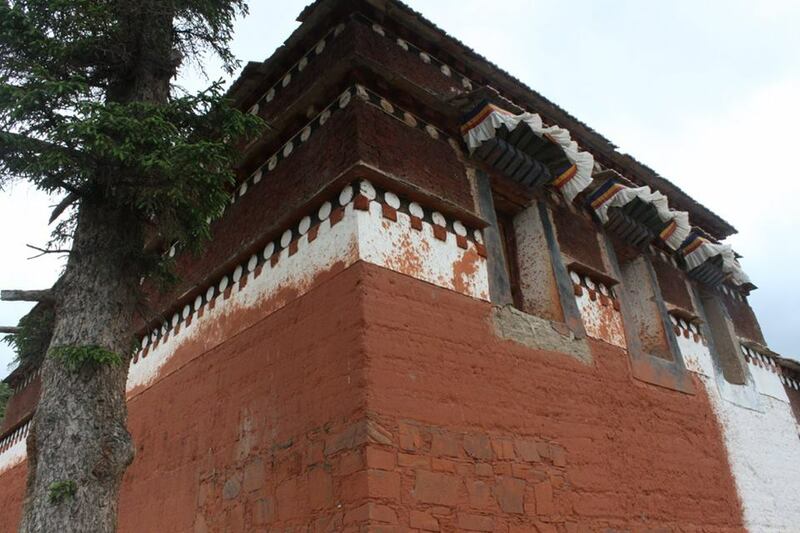 Kangtsa is older than Labrang Tashikyil, and was founded in the late 1600’s by the 4th Panchen Lama Lobsang Chogyigyaltsen’s disciple, Ngomar Ritropa. After the establishment of Labrang Tashikyil, Kangtsa became integrated as a branch of its Medical College, giving its monks the privilege to pursue their studies in Labrang. Today, Kangtsa has about 80 monks. The road to access it was only built less than ten years ago, and before that, it was quite isolated. Kangtsa has always functioned as a Medical College and recently, the monks have built a larger dispensary for outpatients to serve the region. Labrang Tashikhyil was founded in 1709 by the First Jamyang Shepa, Jamyang Shepei Dorje, under the sponsorship of a Qoshot Mongol prince. Many incarnation lines have their seats at Labrang Monastery including the Jamyang Shepa, Amdo Zhamar and Gunthang incarnation lines. Labrang has six colleges, the largest of which is the debate college, Mejung Tosam Ling, which was established by the First Jamyang Shepa when he built the monastery. The Tantric Colleges, Lower and Upper, were established by the First Jamyang Shepa in 1719, and the Upper, in 1943 by the Fifth. The Kalachakra College and Medical Colleges were established in 1763 and 1784 by the Second Jamyang Shepa. The Fourth Jamyang Shepa established Hevajra College in 1879. Tibetan Medicine has its roots in India, introduced on the Plateau along with Buddhist Indian culture in the 11th and 12th centuries. Tibet absorbed early Indian Abhidharma literature as well as wide range of Indian Vajrayana tantras, containing practices based on medical anatomy, all of which formed the base of the Tibetan medical treatises. The Medical College in Labrang is the largest in the area, and has a very active clinic and pharmacy. Most medicines made there are based on the wealth of local medicinal plants that cover the summer pasture, and in summer, we often see monks gathering plants in Ritoma, whose Monastery falls under Labrang’s monastic jurisdiction. Norden began by housing its guests in yak hair, and after a year of just those, Yidam decided to explore further and create an interior that would offer more shelter and could be used longer into the season. He looked at another traditional dwelling, used in the forest areas of Kham and Kongpo; the log cabin. The only examples of log cabins he found made for quite simple living, but he took it as a base, and with a local builder, nicknamed ‘Apple’ for his red cheeks, went on to design the contemporary Tibetan log cabin, complete with a deck and a small attached dry toilet. 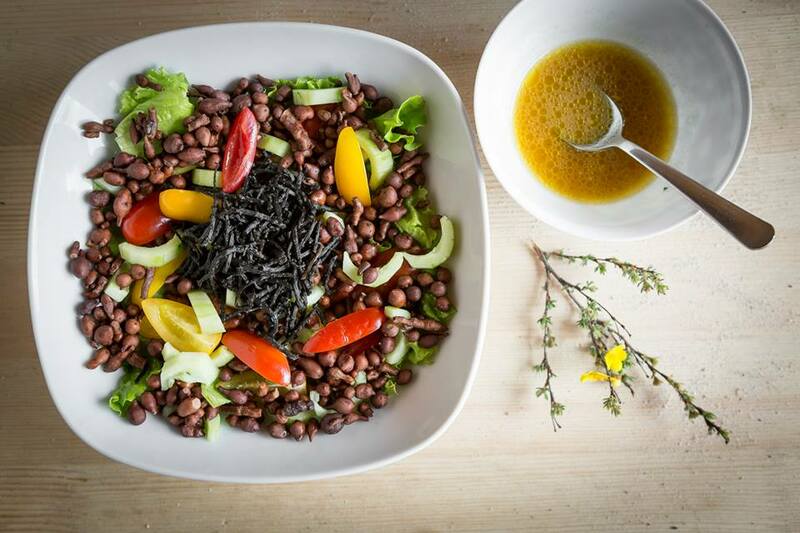 When looking to bring more charm to our Norden Camp dishware, we thought of Tibetan Black Pottery, which had undergone a revival in Gyethang, now commonly known as Shangri La. It was Spring and the guests were not due for another month, so we decided to drive down there, 1,500 km directly south of Labrang. It took three days and was a memorable trip, though I wish we had spent more time on the road, there was so much to see. 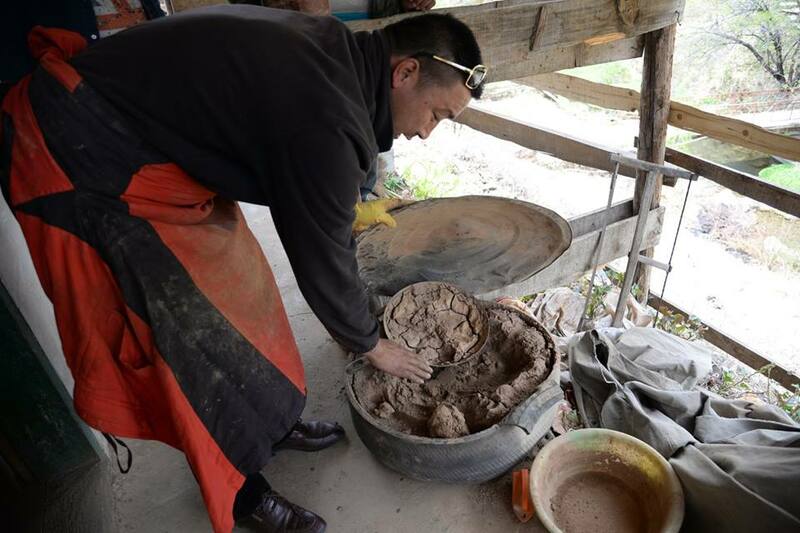 When we reached Gyethang, we saw black pottery everywhere, not always the most practical forms for dishware and visited a kiln, where we saw it being made. 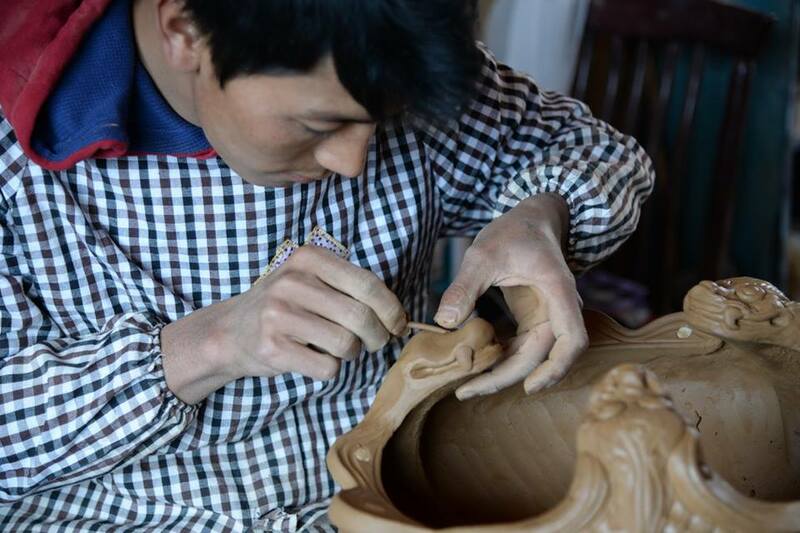 Clay has always played an important role in Tibetan craft. It is used for statues, mixed with high fiber content Tibetan paper, and sun dried. Tea pots and earth ware requore more firmness and impermeability, so the pieces are fired in a kiln after completion. Each area had its particulars in terms of clay, and as in many places in China, Japan and around the world, some have very special qualities and are keenly sought after. 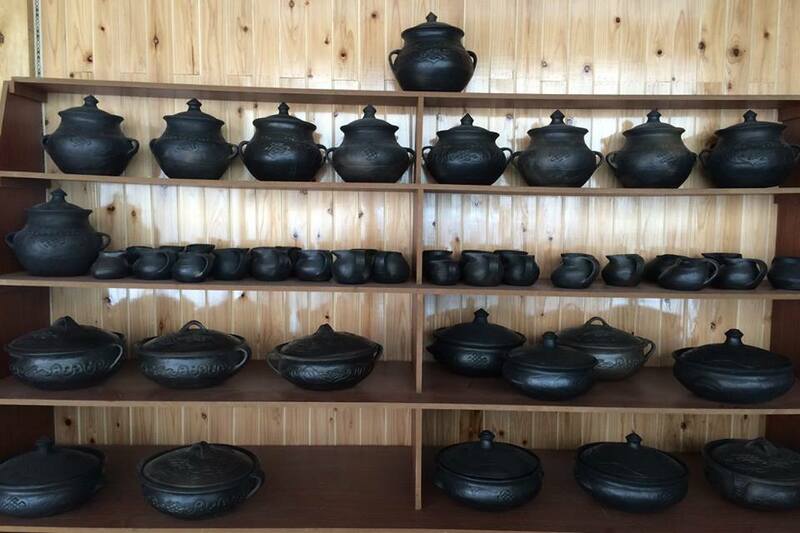 In Gyethang, the clay naturally turns black after firing. Most of the pieces we saw were rather crude, but some small wall decorations bearing the Eight Auspicious Symbols were very fine, and took more time and the hand of a talented artisan to make. 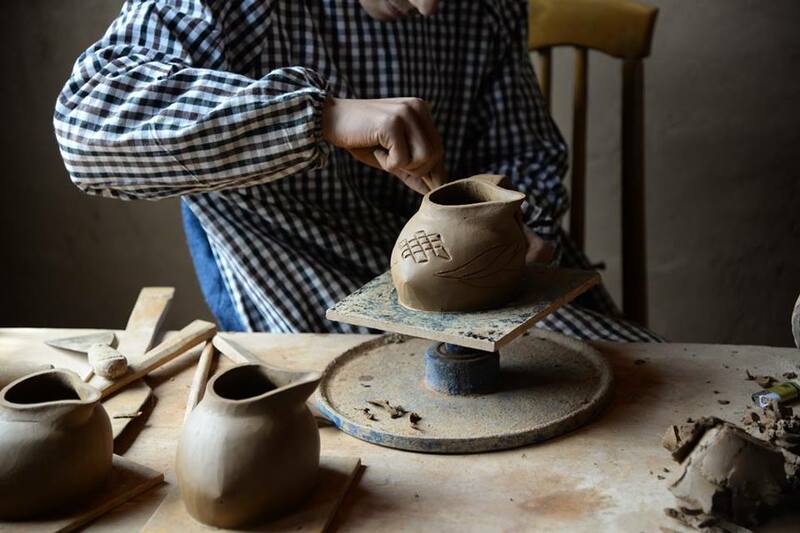 Had we had time, I would have loved to work with the clay artists and make clayware that better lend itself to everyday use, but we didn’t, so Dechen, Yidam and I loaded the car with ready-made pieces; bowls, small flower vases, braseros, and hot pot ware. 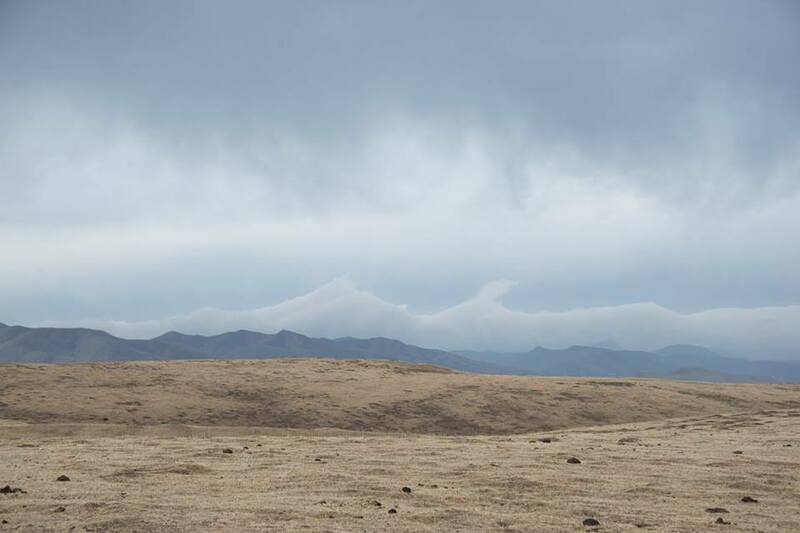 Of all the seasons on the Tibetan Plateau, Spring is the dullest. It starts out with a brown, bare pasture exhausted and depleted by the grazing of thousands yak and sheep who hungrily nibbled on each and every remaining blade. 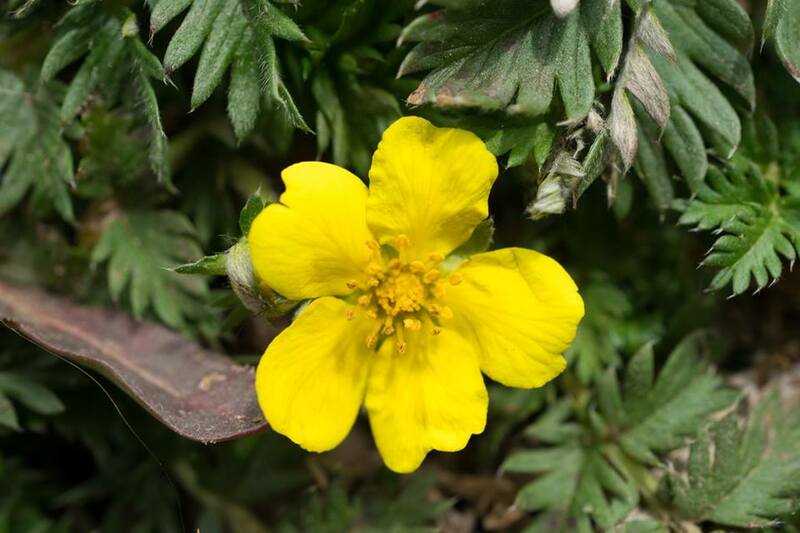 Gradually, in spite of the herds who roam the earth colored expanse, it manages to turn a pale green and, by the end of May the first flowers appear. Timid and tiny, they will soon cover the grassland in a multicolored expanse. Nomads lived in large yak hair tents moving camp 3 to 4 times in a grazing season, following their animals to new pastures. 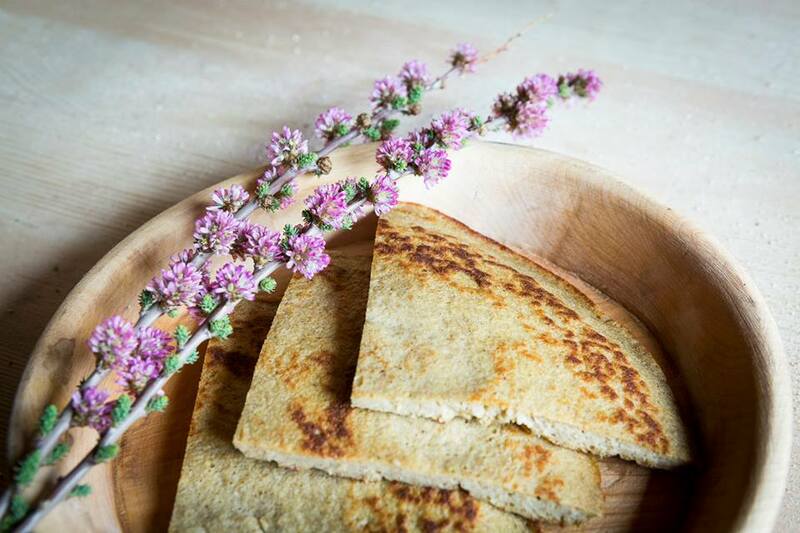 A generation or two ago, families were much larger and everyone participated in the daily chores; women milked the dris and processed the milk, making butter, dried cheese and yogurt and made the dung ready for use as combustible. Children from the age of six took sheep to graze, and men lead the yaks to higher pasture and brought them home every night. In the evenings, everyone gathered around the fire and a meal of thukpa, and the elders told stories. Now families are smaller and scattered, children at school, old people nearer to the monastery and the children, leaving the young couples to tend the animals. The tents are more reduced in size and lighter, and most often made of canvas. Lungta is a cooperative comprising about ten families and their common animals, 140 yaks. They have set up a yak hair tent as they were in the times of large families, with a large mud stove in the middle, bringing back typical nomadic implements, bags containing supplies lined up on the inside, yak hair ropes and cheese drying cloths woven from yak hair and sheep wool. It is a beautiful and inviting space for all to get a glimpse of a lifestyle on the wane. A week ago, my son in law Yidam told me he had something new to show me. We drove a few kilometers from the camp, then branched out on a narrow, steep track to the top of a hill. There, scattered on green hills, was a whole new world, introduced to me as the Lungta Cooperative. 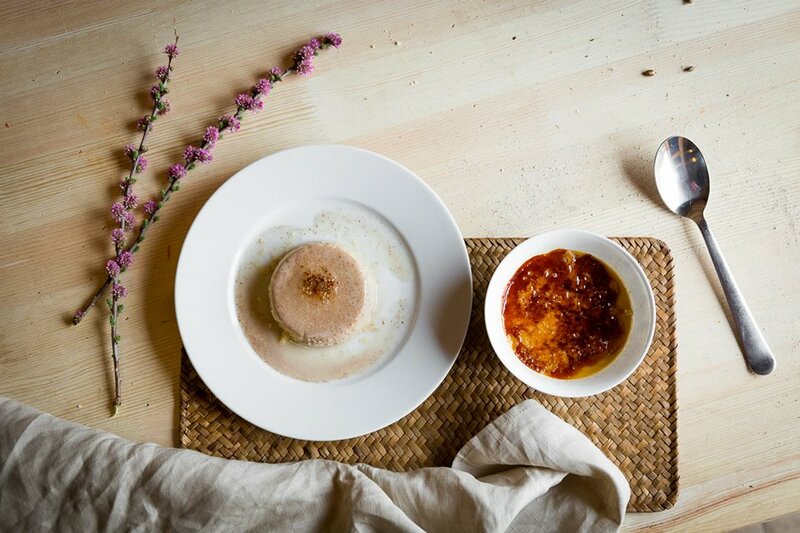 Founded by a group of farmer/herders from Tsayig, Lungta is a groundbreaking enterprise. Begun this year, when a number of Yidam’s cousins requested his help in transforming their livelihood, it is meant to accommodate their skills into the changing world and the opportunities it may offer. Spread over 100 hectares of rolling hills, the cooperative comprises 140 yaks, six mud colored cabins, a yak hair nomad tent and other tents and is manned by twelve nomad men an women. They built a cheese cellar modeled on the ones Yidam saw in the French alps some years ago and are beginning steps to bring a cheese maker from France or Switzerland in view of making a quality yak cheese as well as packaged butter for the local market. 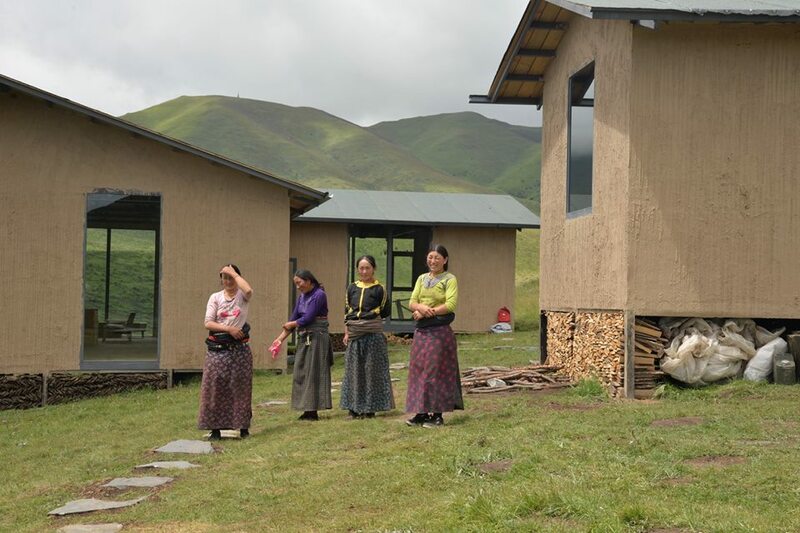 Another of the cooperative’s projects is to organize stays for city teenagers and young adults and give them a feel for country life in Tibet. The Lungta Coop members worked all summer to build the cabins and cheese cellar themselves. They are proud of their enterprise and look to a new future. One of their first customers will be Norden camp, where their products will be sampled at the highest level. Joma is a high protein, bulbous root that grows in clumps in the rich, black soil of the pasture. The native pigs spend all their time scroung¬ing for it, sometimes digging up large areas of grassland. 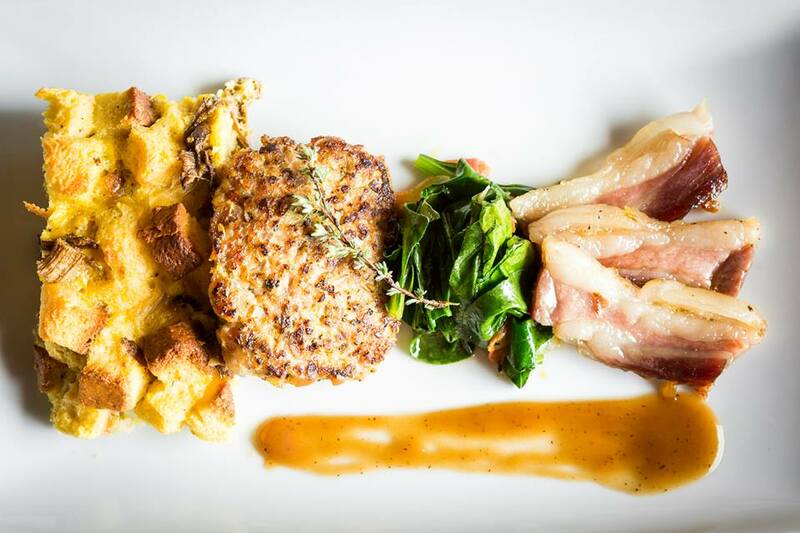 The root lends such a flavor to local pork that the pigs are called “joma pigs.” At Norden joma is also used as the basis for soups, salads and delicious desserts. 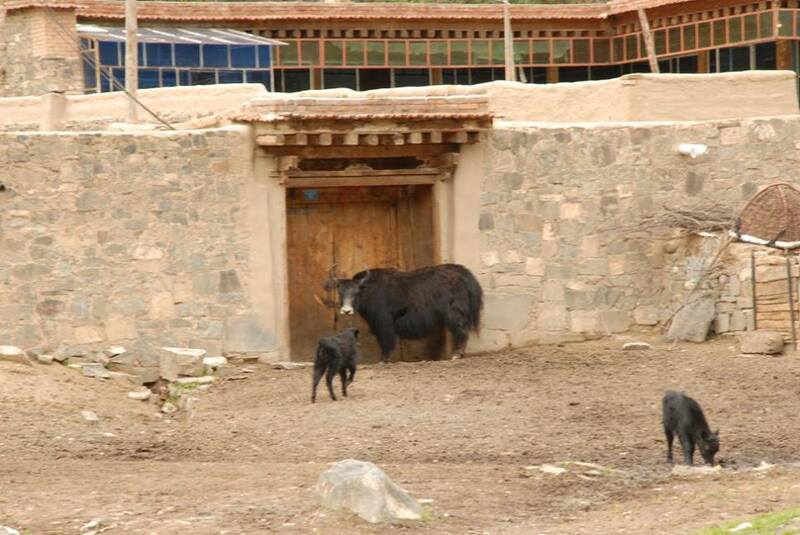 The Old Ram Anyone spending time in Labrang, or familiar with the circumambulation road around the Monastery would have at one time or another seen a very large, long haired Tse thar ram, whose life was spared and who was unofficially adopted by the monastery or its patrons. The ram usually hangs out at the end of the circumambulation route, greeting the pilgrims and begging from them. If not doing that, it wonders among the customers seated at the various little noodle shops across the road from the monastery. A long living goat, I first noticed him ten years ago. His very potent goat smell announces his presence from a surprising distance, depending on the direction of the wind. He doesn’t like children, probably because they tease him, and Norzin was butted a few times, but can’t resist approaching old ladies many of whom must feed him treats on a regular basis. Four years ago, Norden Camp opened for the first time on June 23rd. 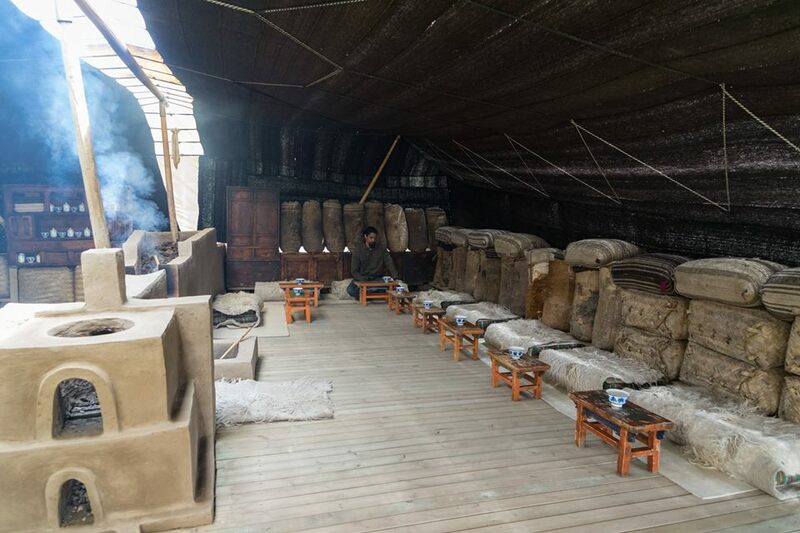 We started small, with four accommodation tents that Yidam had designed from yak hair material, four canvas tent in Tibetan picnic tent style, a log cabin lounge, the sauna and a large yak dining yak hair tents. Our first clients were a group of French travel journalists who cheerfully made due with what we had. The idea soon caught on, and Tibetan, Chinese and foreign visitors soon followed. 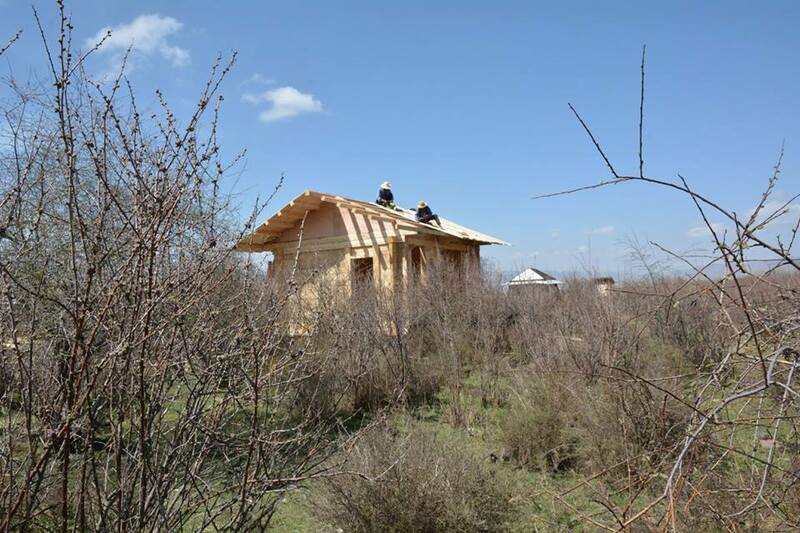 Work had begun in early April, with the traditional clearing of the land from obstacles, a ritual where monks request the local spirit dwellers to move or co habit in peace. It was our aim to retain the character of the land by avoiding structures that required foundations; all our buildings are light and lifted above the ground. There would be no plumbing or running water except in the shower blocks and the toilets were built in the dry Finnish style. The land was leased from a local nomad and it was agreed that his animals were welcome to wander about until they left for higher pastures in June, returning in October. Sheep found the place so accommodating that they tried to settle in the space under the tents, shaking the floor and unsettling the guests. constructions were all based on the old models; large wooden gates, the more elaborate, the more the status, a central courtyard, the rooms huddled around it. The modern touch was overpowering, with expanses of glass verandas to capture the sun, red brick and in the worst cases, tiles. The woodwork was extensive in the houses we saw, lining whole walls, with carved pillar tops and more carved panels between beams and pillars, proudly shown off by the maker, and all finished in shiny varnish. Gang’s workshop was vast, with fellow artisans carving in a room full of finished pieces; altars, thrones, tables, and much more. I noticed they all worked in the same manner as the woodcarvers at Norbulingka, will their set of self made tools lying before them. It was also similar to what I had seen in Kanazawa on the West Coast of Japan, and the patterns and styles were also very close. Gang explained that he had come ten years earlier, when everyone was busy renovating monasteries. Work was plentiful, so he gradually enlarged his business and brought fellow workers from his village in Eastern China, where he returned each year for a few months around New Year. He came from a family of wood carvers in a village where everyone had been a wood carver as far as anyone could remember. With modernization, people had lost interest in the traditional, so he had looked further West to where he could continue to practice his skills and found his place among Tibetans. 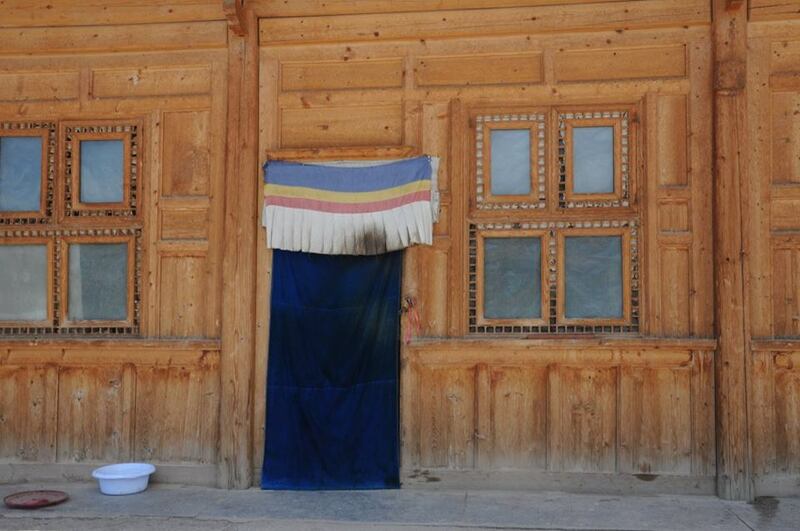 Tibetans in the nomad areas of Amdo seemed to have traditionally limited their activity to herding, farming or trading. Though woodcarvers and builders were and still are plentiful in Central and Eastern Tibet, in Amdo, they seemed to be drawn from other ethnic groups and pockets of Chinese can be found deep in nomadic areas, where they were brought over a hundred years ago to build monasteries. 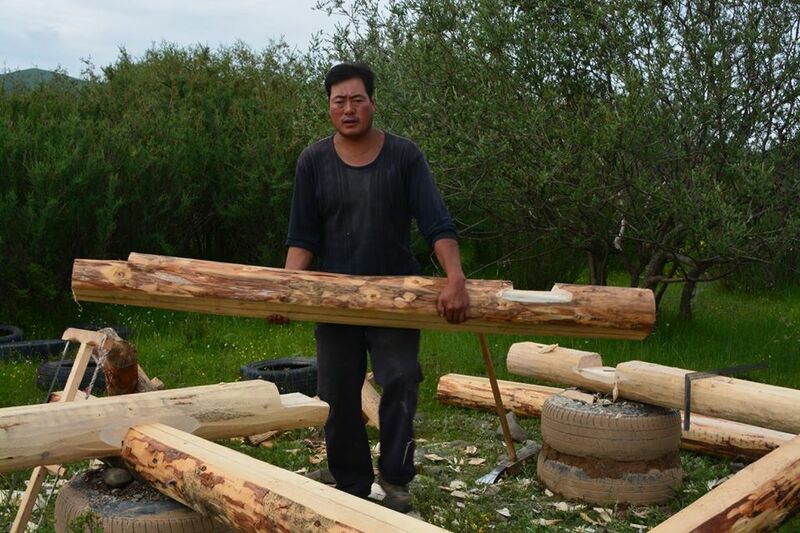 Such a group, Buddhists and Tibetan speaking, built the wooden structure of the Norlha workshop. Gang invited us into his living room, where a whole sheep, wrapped in glad wrap, lay between the coffee table and the television. He lay a plate of fruit and nuts before us, which Norzin quickly cleaned out, and we discussed the plans for the Norlha Guesthouse. My taste in furniture had always been somewhat restrained on the one hand by my Western upbringing, and on the other, by the ways Tibetans viewed their surroundings in terms of old and new, town and country. Having worked for years trying to bring back to memory and existence the best of what was Tibetan furniture, I later realized that the simple and modest, the raw and worn, had been overlooked with a certain disdain (this is peasant stuff) characterized by both Tibetans in Tibet and in exile and had, as a result, escaped my attention. My father, in spite of his undying love for Lyon silks, Louis XV chairs and gold leaf, also appreciated rustic French peasant furniture, which we used in every day context. Dechen and I carried this on, in the form timid love for a low, solid, worn table given to her by Yidam’s family, a few pieces from the local Tso bric a brac store, and the cheese cloth, traditionally used by nomads to dry cheese on, locally woven from yak hair and sheep wool. I also noticed the cabinet in Yidam’s monk brother’s house in Labrang, which hung on the kitchen wall, displaying the bowls and cups, with drawers that doubled as butter boxes. Local notions prevailed, though. The table, displayed on the kang in their house had to be relegated to the back room when monks came, and replaced by a hideous varnished impostor and the cheese cloth, reminded of its low rank, was barred from covering a table, and relegated to placement on a large, wooden tsampa box on the veranda. My friend Isabelle Graz, a Swiss Designer who worked in China at the time, shook things around and pushed the vernacular to center stage, gradually eroding local notions and prejudices. It started when I accompanied her roaming in the Shanghai area bric a brac warehouses. These huge spaces, divided into alleys, had furniture piled as high at it could go. The trendy art deco from the twenties and thirties had long gone, driving the Shanghai furniture traders to dig deeper inland, into Shanxxi Province, bringing out old peasant furniture. Five years ago, no one really paid much heed to an old concubine’s chair, a wood and bamboo larder or a two hundred year old armoire. They were faded, scratched, wearing marks of hundred years of use. With their simple curves, solid appearance, these pieces weighed of simplicity and functionality. The local Tibetans and Chinese visitors winced at first when they saw our newly purchased, wobbly assortment spread out in a tent in front of the unfinished guesthouse, recognizing things of their past that had long been discarded as old and useless by their parents or themselves. Within a few weeks, notions changed. Placed in context surrounded by Norlha felt and woven soft furnishings, they settled gracefully, exuding a simple dignity, a quiet elegance that lent the rooms and common areas a cosy/trendy feel. Isabelle furnished the Norlha Guesthouse with these and custom made pieces forming a simple, harmonious ensemble. 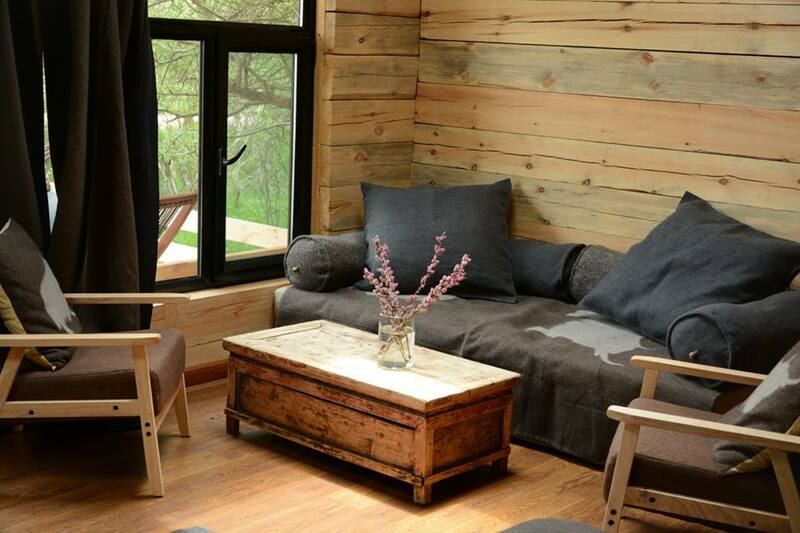 A year later, when we turned our attention to Norden Camp, we decided to look even more locally for the cabin, tent and venue area furniture. Isabelle had a knack for uncovering treasures; When we drove between Ritoma and Labrang, she would suddenly ask that we stop the car at the sight of a junk pile, from where she would extract a door, an old window, or a low table from the rubble of a dismantled house. Dechen, Yidam and I learned to look at things differently, to see treasures in the ordinary objects that surround a quickly disappearing lifestyle. Yidam quickly picked up a flair for rummaging through the rubble of demolished houses and began collecting old latticed windows, remnants of a not so far away past when people pasted thick oiled paper in lieu of glass. 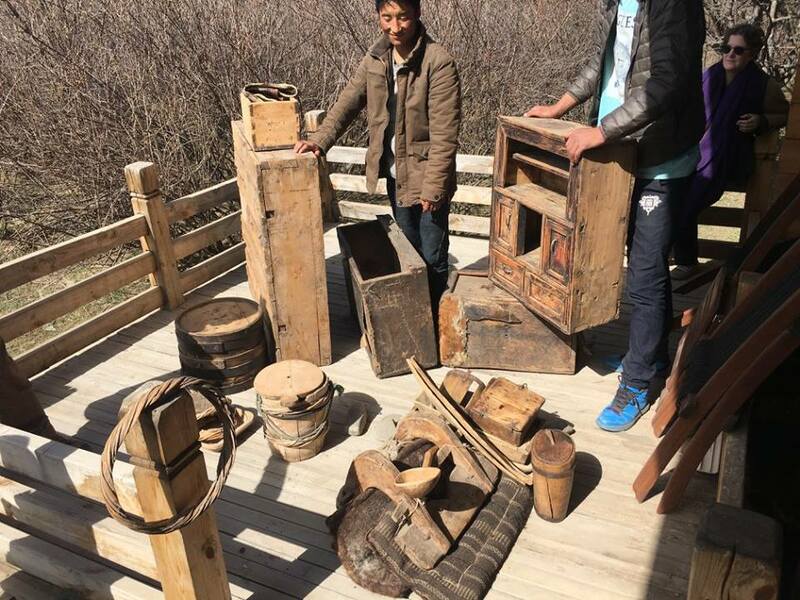 During the fall of 2013, he and Dechen sent out the Norden team to forage for trunks, tables and kitchen cabinets in Yidam’s native area, Tsayig. They came back with tsampa trunks covered in yak or dzo hide, cabinets of all sorts and sizes, butter churning implements, butter boxes, low tables and more. The team would photograph the piece on their phone, send it to Yidam and Dechen who would give their ok. Norden has continued and refined its yearly winter village foraging, complementing our assortment with locally woven baskets, carved wooden trays, clay bowls, old rifles, and even an old cart, which have wormed their way into not only the Norden venues, but also accessorizing the Norlha stores. 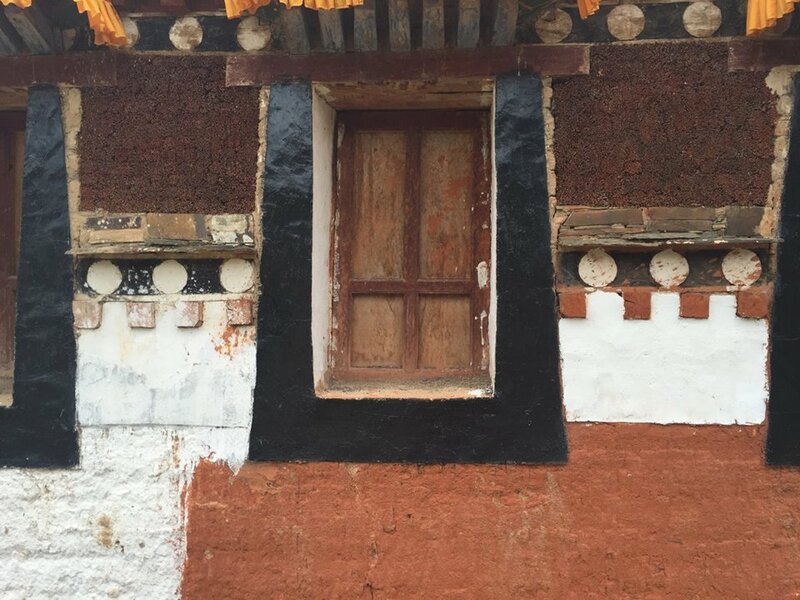 In a mere two years, perceptions have changed and the contemporary/old look is finding its way all over Labrang. New Trends, new ideas. Labrang has two distinct sections; the monastery and the town. The monastery tails out into the Ngagpa College, then the Nunnery. Walking beyond, one crosses a village, then comes to an area of open fields, in a valley flanked by hills that slowly spills out into the greater plains of Sangkhok, the nomadic area where Norden is based. The foot of the steep hill is dotted with the dark openings of caves, some fitted with the remains of doors. Curious, I asked what they were; over forty years ago when young people were sent from China to work with peasants, they had lived and died in those caves. It sounded like a dreary episode that no one really wanted to remember. As one progresses, there are more small villages huddled against the hill, the Tsampa mill, and a walled garden that looks like a debating ground where people sometimes picnic. The last important landmark on that road is the Hotel. Around 2007, we went to visit what was known as Labrang’s best hotel. It was built in the 80’s by an enterprising returnee from Switzerland on the grounds of what had been Jamyang Sheba’s Palace. The entrepreneur obviously had had different ideas on building and hospitality which he implemented in the various spaces; there was a modern building with brass and glass and an electric coconut tree, with the usual lobby that sports what I refer to as the ‘toad’ chairs, with armrests as large as the seating area. One then moved onto a garden with a central lawn surrounded by concrete picnic tents, with flaking paint. There was also a mysterious walled area with an old style building, the Palace, we were told. Keys were brought out and the main door, set in the surrounding stone masonry wall, flung open. Inside were pavilions decorated in murals and brightly painted traditional woodwork that surrounded successive courtyards. The style was a mixture of Ching Dynasty and Tibetan traditional and the place had a run down charm about it. At some point, someone had tried to make a hotel; there was a sign for a dining hall, filled with broken furniture. The rooms were furnished like the Soviet hotels I had stayed in in Mongolia, where officials spent their holidays, with damaged furniture, cracked cups and lamp fixtures particular to that era. The hotel lease had ended after twenty years, the Swiss Tibetan had moved on and the government department in charge was waiting for someone to take on the venture, renting out the concrete gers in the meantime. Three years ago, someone took it over and we stayed there while preparing Norden Camp’s first season. The tents were a little humid, but an effort had been made with proper bathrooms and brocade on the walls. We visited the Palace again; it remained in condition we had seen it in last, abandoned and exuding a tired beauty. The awnings were in tatters, the reception rooms filled with rubble. Jamyang Sheba seems to have forsaken his previous incarnation’s palace and built himself an impressive structure closer to the town. Painted a pinkish red, it is called “Norzin Podrang” ,which my granddaughter Norzin finds fantastic.